The DVD includes ceremonies, speeches, presentations by Arnold Schwarzenegger and a tribute to Bob Kennedy to round out the contents of this great show. 4 massive hours on one DVD in Open Region, suitable for all DVD players worldwide. Includes the COMPLETE PREJUDGING & FINALS for the Arnold Classic and approximately 2 hours of ARNOLD STRONGMAN. The 8 hours 2 DVD set on THE AMATEURS is also available, see details below. COMPLETE 2012 ARNOLD AMATEUR RESULTS. 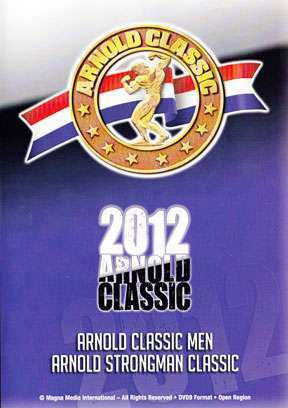 COMPLETE 2012 ARNOLD CLASSIC EVENT RESULTS. Michael Jenkins of Hershey, PA won his first Arnold Strongman Classic contest over an international field. This new star captured the 11th Annual Arnold Strongman Classic title. Mike is pictured above right. Mike Jenkins also set three world records, in the Circus Dumbbell, Timber Carry and the Austrian Oak Lift.